New business models, acquisitions, investments are changing the semiconductor ecosystem. Shifting business models, acquisitions, minority investments and increasing uncertainty are creating fundamental shifts in the semiconductor industry that could redefine who is successful in which markets for years to come. The announcement today that Rambus is developing memory controller chips, expanding its business beyond just creating IP for the memory and security markets, is the latest in a stream of public disclosures and behind-the-scenes deals that have been underway for the past 18 months. And while the Rambus move is significant by itself, in the context of all the other moves over the past 18 months it blends into a landscape of equally dramatic changes. A just-released PricewaterhouseCoopers report identified several drivers for the recent string of semiconductor industry acquisitions. Among them are access to new markets or customers, closing up gaps in portfolios, resource augmentation to enable scaling, and increased market leverage. In Rambus’ case, the opportunity fits a couple of those criteria, namely access to new markets and portfolio gap closure. Jerome Nadel, the company’s chief marketing officer, said it has been getting harder and harder to create a server interface for DDR4 and top customers were asking for help. The challenge for Rambus was developing a cohesive strategy for continuing to provide IP—what Nadel calls “IP as a product and IP in a product” — while making sure it didn’t step on the toes of existing memory chip customers. The solution was a DDR4 memory interface chipset that competes directly with companies such as IDT, China’s Montage Technology, and Inphi, but none of Rambus’ memory IP customers. At the same time, considering that Rambus has been developing IP to work with this interface technology for years, it adds another potential revenue stream to Rambus’ IP portfolio. It will be designing and selling chips for the first time using a fabless model. Set in the context of the semiconductor IP industry, however, this deal isn’t all that surprising. Arm, Synopsys, Cadence, Mentor Graphics and Rambus all have been buying up IP companies that are logical extensions of their businesses into adjacent markets, such as software, security, processors, subsystems, and memory verification IP. For all of these companies, this has proven to be extremely lucrative. That accounts for a string of Cadence acquisitions, elevating the company from a virtual no-show in the IP business to the No. 4 hardware IP provider, and it puts perspective on Mentor’s concerted push into automotive software. Even on the hardware side, these kinds of expansions are not out of the usual. NXP‘s pending acquisition of Freescale and Intel‘s pending acquisition of Altera have a similar objective of growing share in their respective chip markets. In fact, Intel sold off its FPGA business to Altera in the 1990s, and now is buying back that business plus the rest of Altera. The company also purchased Docea Power late last month, ostensibly to help with power and thermal simulation/modeling when Intel and Altera chips are integrated together. A bigger question mark for the whole ecosystem involves offshore investments, particularly from China, which could accelerate all of these moves and force deals as defensive measures. China’s technology industry is looking to fill in gaps in its current offerings, and it is much faster to buy than to build. That has has prompted a proposed $23 billion bid by Tsinghua Unigroup, a state-owned chip design company, for Micron. According to Srini Sundararajan, analyst at Summit Research Partners, that proposal is likely to evolve into an investment rather than an acquisition due to national security concerns by the U.S. government. And behind all of this are questions from investors about where the value will be for semiconductors over the next few years. While the declines are flattening, according to the PWC report, the reduction in ASPs from a high in 1995 and a resurgence in 2005 mean companies have to fight for fewer dollars in hardware, or pick alternative approaches in adjacent markets. There are some bright spots, though. “For certain segments such as automotive and industrial we expect to see ASPs stabilize driven by both scale effects and the growing demand for semiconductor ICs within these applications,” said PwC’s Mehrotra. “ASPs for computing and consumer segments will continue to face downward pressure, especially for devices such as sensor ICs and low-power embedded processors which are experiencing growing volume forecasts. ASP trends for semiconductor devices. 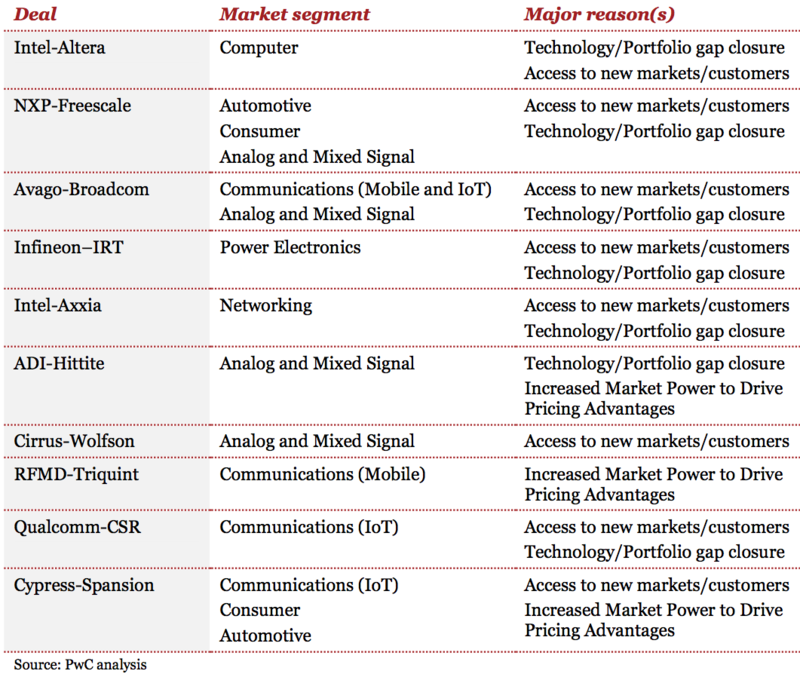 Source: SIA and RBC Capital markets 2015 semiconductor outlook, as compiled by PWC. Thanks for the timely article. Do you think Spansion’s NOR flash will be overtaken by new Intel-Micron transistor-less flash? It is rumored to be a NOR flash killer technology…and rad-hard as well. Cypress just bought them mostly for that NOR flash I have heard…or am I wrong about that? There are so many memory options out there that it’s hard to tell what’s going to win. The danger is that the field gets too crowded with no clear winner, which ultimately weakens all of them. Right Ed, but now that I am semi-retired, it looks good for consumers like me..cheap gas, cheap airfares, and cheap electronics. But after 50 years making chips….I sympathize with the pace of competitive pressures on semi companies…thus the safety of analog and other “precision” products.